The foredeck on the 74.5 metre Abeking & Rasmussen Elandess sits just forward of the yacht's spectacular observational lounge. Populated with relaxed seating, it is a special place where the owner and his family enjoy a regular aperitif. "We particularly enjoyed having pre-dinner drinks on the foredeck seating area, which is out of view of the wheelhouse. 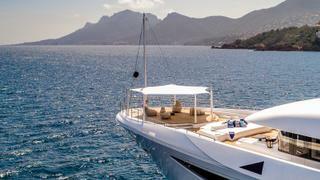 It’s rare for yachts to have that capability," he told Boat International. The foredeck on the 74.5 metre Abeking & RasmussenElandess sits just forward of the yacht's spectacular observational lounge. Populated with relaxed seating, it is a special place where the owner and his family enjoy a regular aperitif. "We particularly enjoyed having pre-dinner drinks on the foredeck seating area, which is out of view of the wheelhouse. 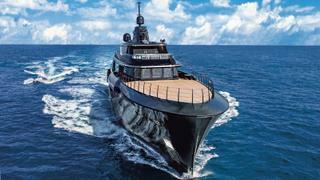 It’s rare for yachts to have that capability," he told Boat International. 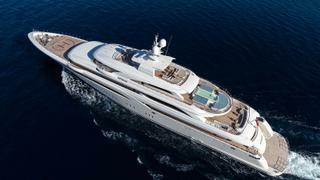 The foredeck on board the 85 metre Golden Yachts flagship O'Ptasia has been entirely dedicated to the yacht's impressive helipad, which allows guests to make swift entrances and exits in style, a must for a regular charter boat. Foredecks are much more than just empty space for tender storage — they can be used to add some seriously premium on-board features. Our round-up starts with the flush fit, teak-clad and stylishly minimalist foredeck of the 54.8 metre CRN superyacht Atlante, which conceals a teak table and chairs that retract into the floor to become invisible and let the deck serve as a superyacht helipad. The owners didn’t need a helipad on this 74 metre CRN, so they created a grand entertaining space instead, with a tented area for sun protection — it’s a hot spot for karaoke. Delivered in May 2017, Cloud 9 is the Italian yard’s second largest launch to date behind the 80 metre Chopi Chopi. 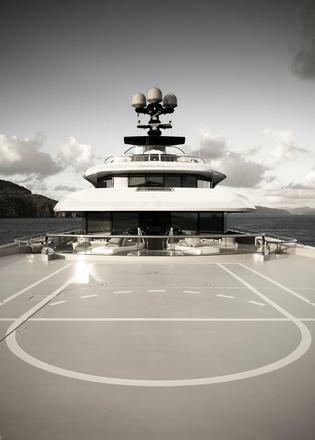 Shahid Khan, owner of Fulham FC and the NFL’s Jacksonville Jaguars, made suitably sporty use of the huge foredeck on his Espen Øino-designed 95.2 metre Lürssen superyacht Kismet, which is set up for half-court basketball. It can also be converted into a touch-and-go helipad when needed. The long, lean, low-slung styling of this 44.8 metre allowed Luca Brenta Design to think outside the box with a spectacular 5.5 metre foredeck spa pool. 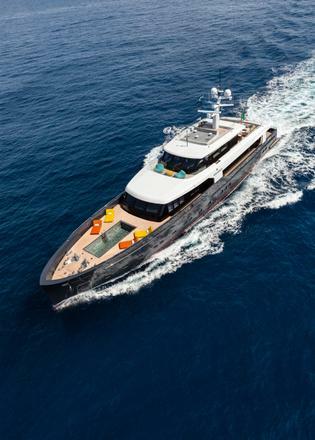 The debut 2014 launch from Italian yard Logica Yachts, the Logica 147 features accommodation for up to 12 guests and nine crewmembers in an interior styled by Martin Kemp Design. An outdoor lounge forward of the superyacht wheelhouse on the first Mangusta Oceano 42 yacht Namaste features a shallow infinity pool that cascades down to the foredeck. 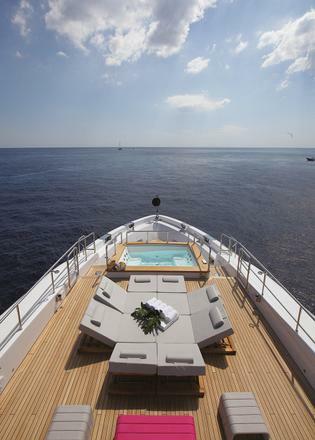 Italian yard Overmarine has also added large adjacent sunpads, which are ideal for relaxing on board while topping up your tan. She may only measure 35.5 metres LOA, but Oli makes the most of all her exterior spaces. 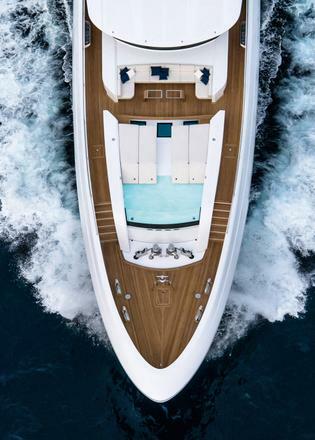 The star of the show is a foredeck spa pool — a feature that is specified as standard on all Mediterraneo 116 yachts. 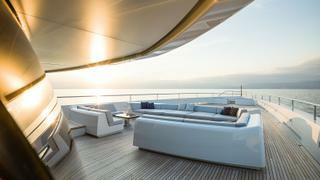 This new range from Italian yard Benetti was designed by Giorgio Maria Cassetta.